Charles G. Francos, M.D. 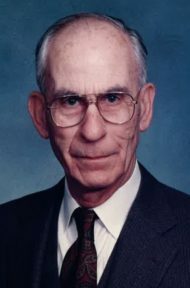 95, of Lancaster passed away peacefully on April 6, 2019 at The Mennonite Home, where he had resided for the past few years. Born in Mytilini, Lesvos, Greece, on October 6, 1923, Dr. Francos was the son of the late Yorgos and Eleni (Tzeliadi) Francos. He was married to Esther (Gannes) Francos for 72 years. Dr. Francos emigrated from Greece at the age of six in September 1929. He was proud of the fact that he was born a U.S. citizen because of his father’s U.S. citizenship, which he earned fighting for the U.S. in the Allied Expeditionary Force during World War I. Less than eleven years after arriving in the U.S., Dr. Francos graduated from J.P. McCaskey High School in the first class that completed all three years of high school in the new building. He was later honored by the McCaskey Alumni Association as a distinguished alumnus. In the spring of 1941, Dr. Francos enrolled at Franklin & Marshall College, graduating in three years with a chemistry and biology double major. He was elected to Phi Beta Kappa at F&M, and served as a midshipman in the U.S. Navy V-12 Program during World War II. Dr. Francos matriculated at Jefferson Medical College and graduated in 1948. After completing his residency at the former St. Joseph’s Hospital in Lancaster, Dr. Francos opened his private medical practice. However, not long after he began practicing medicine, and rather that waiting to be recalled to military duty, Dr. Francos enlisted in the U.S. Air Force during the Korean War. He served as a flight surgeon during the war, and resigned at its end as a major. Dr. Francos returned to Lancaster after his tour in the Air Force, and practiced general medicine for the next 35 years. He maintained offices in Lancaster during his tenure. Dr. Francos served as the college physician at F&M for 17 years, and was on the medical staff of Conestoga View Nursing Home for 20 years. He was also deputy coroner for many years. Dr. Francos was a lifetime member of the Annunciation Orthodox Church in Lancaster. Under his leadership, the congregation built and moved into its current location on Hershey Ave. in 1960. Ten years later, Dr. Francos led the effort to build the Philoptochos Hall, in which the annual church bazaar is held. In addition to serving on the parish council for many years and in many capacities, Dr. Francos was the choir director at the church for nearly 40 years, and a member of the order of the AHEPA, Red Rose Chapter. A strong believer in the value of education, Dr. Francos served on the School Board of the School District of Lancaster. He also served Lancaster County’s Office of Aging, and represented the organization at the White House during the Clinton Administration. During his rather limited spare time, Dr. Francos could be found boating on the Chesapeake Bay, or on a boat near his summer home in Avalon, NJ. He was extremely fond of fishing, and it is not believed that in his entire residence in Avalon, he ever stepped foot on the beach. In addition to his wife, Dr. Francos is survived by his sons, George C. Francos, M.D., and his wife, Barbara, Haddonfield, N.J.; Charles G. Francos, Lancaster; and William S. Francos, Esq., and his wife, Andrea, Sinking Spring, PA. Dr. Francos is also remembered as a kind and loving papou to his grandchildren: Julia (Charles) Montgomery; Gregory Francos; Lauren (Jarad) Kohr; Emily Francos; Andrew Francos; and Mary Francos. He is also survived by his great-grandchildren Cora Montgomery and John Kohr. He was preceded in death by his daughter Alexis, and his sisters Angeline Diamandaras, and Dorothy Francos. In the last analysis, Dr. Francos came to the United States, worked hard at all he did, and made the most of every opportunity proffered him during the 89 years he spent here. As a result, he enjoyed a full and most wonderful life surrounded by his family, friends, and patients. He will be missed by those he left behind. Funeral Services will be held on Thursday, April 18, 2019 at Annunciation Greek Orthodox Church, 64 Hershey Ave., Lancaster, at 10:30 AM, with the Rev. Hector Firoglanis and Rev. Alexander Veronis. The family will receive visitors at the Charles F. Snyder Jr. Funeral Home and Crematory, 3110 Lititz Pike from 6:00 to 8:00 PM and Trisagion service at 7 PM on April 17, 2019. A second viewing will be held at Annunciation Greek Orthodox Church on Thursday morning from 9:30 AM until 10:30 AM. Interment will be held at Conestoga Memorial Park followed by a luncheon at the Conestoga Country Club. In lieu of flowers, kindly send donations in Dr. Francos’ name to the Annunciation Orthodox Church, 64 Hershey Ave., Lancaster, PA.
A kindly next door neighbor and family man of whom I will always maintain the fondest memories. My love and condolences to his family. Our condolences to the Francos family. may his memory be eternal. Dr. Francos was my choir director and I learned so much. he was a wonderful person will be greatly missed. Dr. Francos was my doctor for many years at his private practice. I have never known such a kind caring doctor who always knew what was wrong and knew how to fix it. He will be missed by so many. Keeping all of you in our thoughts and prayers. Dr. Francos was my dear Nouno (godfather). My mother would always share stories about him from when she was a little girl growing up in the Greek community. She and her friends always looked up to Nouno with great admiration for his work ethic and humility. His example led my parents to ask him and sweet Nouna to serve as my godparents, and I feel so blessed to be linked to both of them. Much love and memory eternal. Dr. Francos delivered our son in 1960. He was a very caring doctor and a very good man. We are proud to have known him. Our deepest condolences to his family. Have good memories of Dr. Francos when I worked at St Joesph’s Hospital in Lancaster.